Some suspected members of the Eiye cult group have beheaded a member of their rival cult, a tax collector simply identified as Osazuwa. Osazuwa, a father of three, was killed at Iyobosa Street off Muritala Mohammed Way, Benin City yesterday. “The gunmen came in commando style and started shooting sporadically to scare away people and afterwards attacked the victim (Osazuwa). “Osazuwa tried to run for his life but a member of the gang who had closed on him hit the deceased with a rod and he fell down. “Other members of the gang immediately descended on the victim and used cutlass to severe his head”. 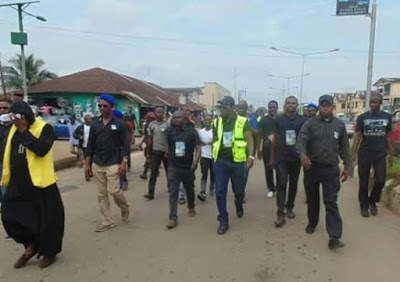 It was gathered that the killing might is connected with a renewed cult activities over a recent disagreement between members of the Maphite Confraternity Group aka Green Circuit Association and Eiye confraternity group.